Home > Share - ETFs > A to Z of Bharat 22 ETF..! Bharat 22 is the new ETF announced last week by the Government, the unbeaten winner in the catchy-names contest. 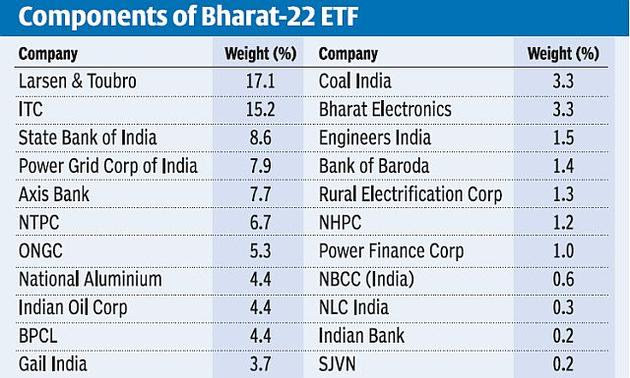 Bharat 22 is an ETF that will track the performance of 22 stocks the government plans to pare its stake in. An ETF (exchange traded fund) pools money from investors and channels it into a basket of stocks, mirroring an index and its performance. An ETF unit represents a slice of the fund; issued units are listed on exchanges for anyone to buy or sell at the quoted price. Besides public sector banks, miners, construction companies, and energy majors, the ETF will also include some of the government’s holdings in SUUTI (Specified Undertaking of Unit Trust of India). In fact, the SUUTI heavyweights (L&T, ITC and Axis Bank) have a 40% weight on the index. Other big names in the long roster include SBI, Power Grid, NTPC and ONGC (5 to 9% each). Tail-enders include NALCO, Indian Oil, Coal India, Bharat Electronics, Bank of Baroda, NBCC (India), Indian Bank and SJVN. The Bharat 22 ETF will be managed by ICICI Prudential AMC while Asia Index will be the index provider. The index will be rebalanced annually. The ETF mechanism has proven to be a smart, effective way for the government to help meet its disinvestment targets, a key factor to keep fiscal deficit under control. Earlier, when the government set out to monetise the family silver by selling big stakes in individual PSUs, the stocks would invariably get beaten down in the run-up to the offer and also attract employee ire. The ETF route provides a neat workaround by letting the government pare small stakes (2-3 per cent) in a big basket. Everyone’s happy — the state gets its money, investors get a piece of PSUs and employees are glad to stay under the PSU umbrella. The energy stocks-heavy CPSE ETF, launched in 2014, has raked in a cool Rs. 11,500 crore or so in three tranches. And the Government seems to be aiming higher this time. The Bharat 22 ETF has more than double the 10 stocks in the CPSE ETF and much wider sector coverage. The divestment target in 2017-18 is Rs. 72,500 crore, of which just about Rs. 9,300 crore has been raised so far. The Government has made no secret of its intent to use the ETF route as a vehicle for disinvestment. So, expect Bharat 22 to make a splash. The timing and the composition of this ETF is also nifty. The market is on a roll and the Government can extract top dollar. Also, by mixing and matching the good and the not-so-good, value can be got from stocks which otherwise might have found the going tough. The Government will likely launch the Bharat 22 ETF soon when the going in the market is good. You will have to decide whether to invest. As in the past, the Government could throw in goodies such as discounts or bonus units to woo you. Should you bite? Maybe, if the deal is good, you like the index composition and PSU stocks, and want to help the Government. Maybe not, if you can home in and select individual stocks that could offer a better deal without buying the whole basket.